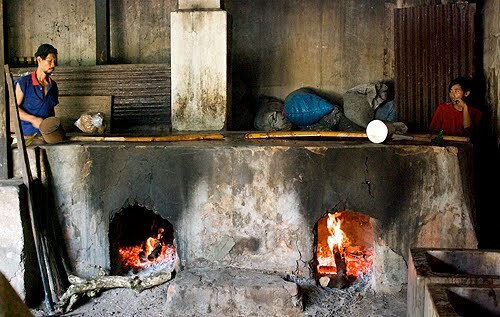 After spending most of the summer in Indonesia, I have had a longing for some good bread. While Indonesia has great food, its bakeries are weak. Indonesians tend to favor over-processed, Wonderbread-like fluffy baked goods. Despite this, or perhaps because of it, toast (roti bakar) is a popular street snack, something I never could understand. 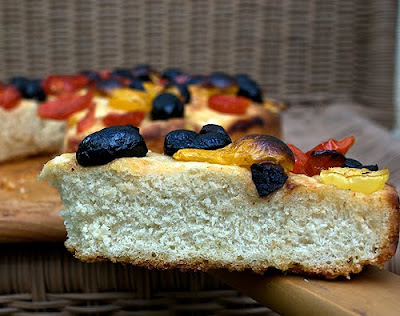 Focaccia is a good antidote to the tasteless loaves of Indonesia. This particular recipe, from Saveur, produces a crisp bottom crust and a good crumb. The combination of olives and tomatoes on the top is a wonderful use of local produce that captures the essence of a summer day in the central valley. 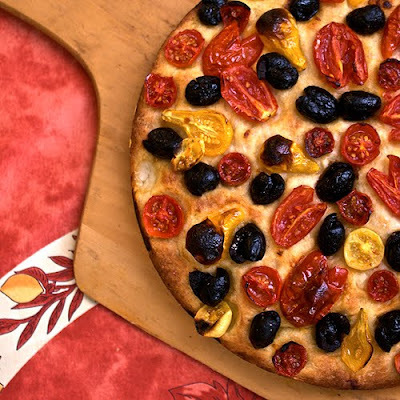 A slice of this along with a salad and you've got yourself a satisfying meal. The recipe is from issue #120 of Saveur which I happened to pick up to read about Andrea Nguyen's account of her return to Saigon. 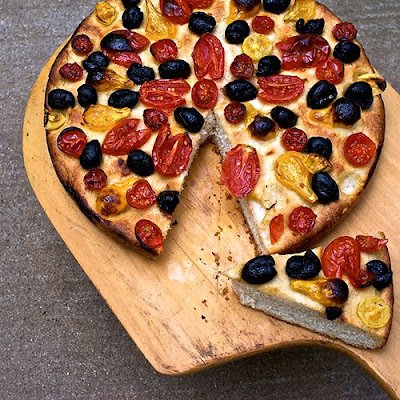 Saveur also has the recipe on its site. 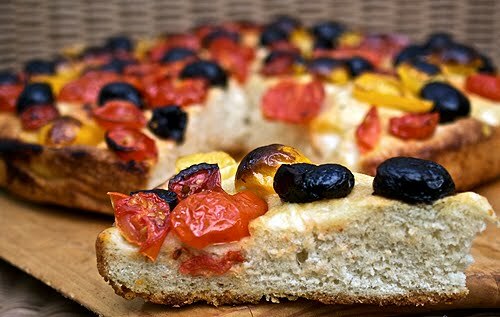 Click on Focaccia with Tomatoes and Olives to get the recipe. This is a staple dish in our house. It is also a fixture at potlucks at my wife's school because it is cheap, quick, healthful, and delicious. Almost any time we have roast chicken, whether it's one I roast or a rotisserie chicken picked up at the supermarket, we have this the next day. As neither Tjing, my wife, nor I are particularly fond of chicken breast, finding it generally to be rather dry and flavorless, this is a great way to use the meat. While I prefer it with rau ram (daun laksa or Vietnamese coriander), mint is a perfectly acceptable substitute. The dressing does not use oil and can be easily adjusted to different tastes. When I make this for school potlucks, I am careful about not making it too spicy; teachers are such sensitive souls. 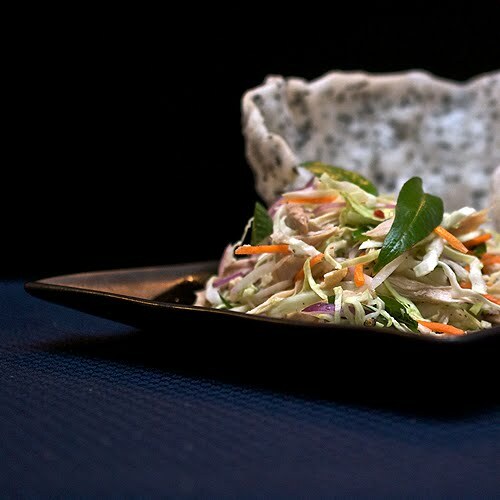 Some recipes call for using rice vinegar for the dressing; others use lime juice. Personally, I prefer the latter. 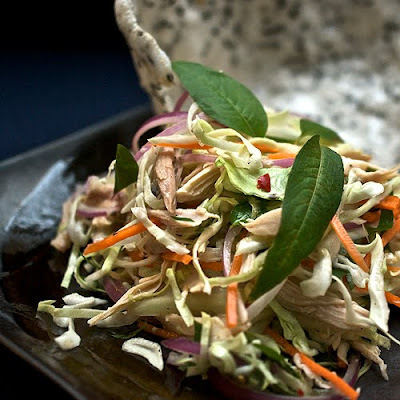 The freshness of the lime makes the salad so much more lively and refreshing. If you have some ground roasted peanuts or fried shallots on hand, a tablespoon or two make a nice addition on top of the salad. Combine ingredients for dressing and adjust to taste. Combine salad ingredients. 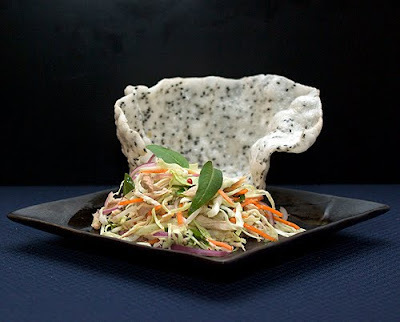 Toss with dressing just before serving (if you dress the salad too soon the vegetables will lose their crispness and become limp). 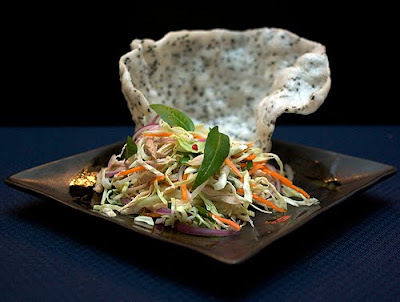 Rice crackers (banh da) or shrimp crackers (banh phong tom or krupuk udang) make a nice accompaniment. 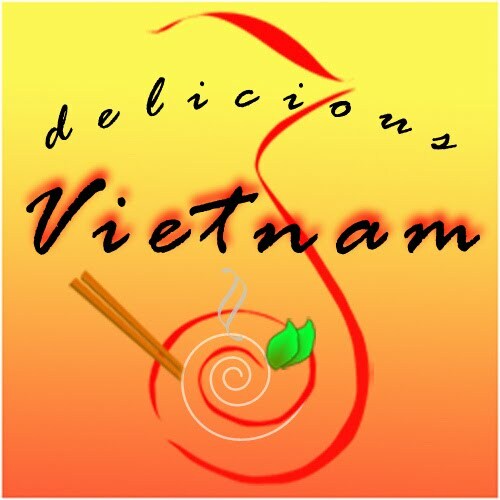 I am submitting this post to Delicious Vietnam, a monthly blogging event founded by Ravenous Couple and A Food Lover's Journey to celebrate and explore Vietnamese cuisine. 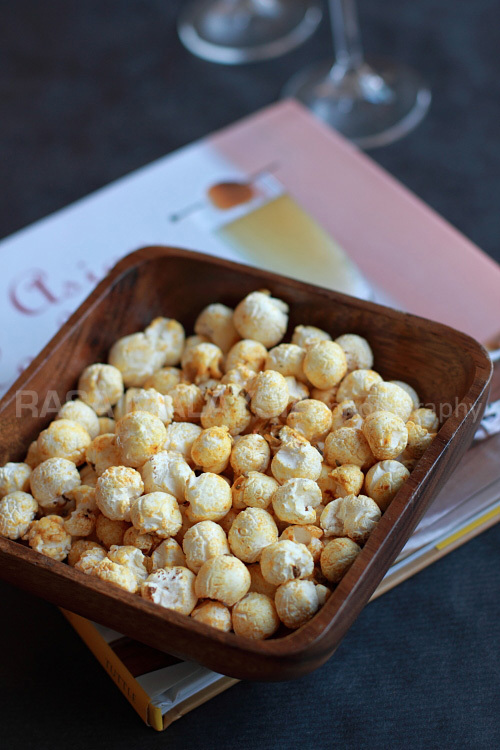 This month's host is Anh of A Food Lover's Journey. To learn more about Delicious Vietnam and how you can participate, click here. When our bookclub gets together, I am usually the one who brings dessert. We used to be a larger group, with a much greater range of cooking abilities and tastes. Over time life has intervened, one couple broke up and drifted away, another has found other interests, and what remains is a group who enjoy the shared reading experience and the excuse to get together every six weeks or so, but no real interest in cooking. One is still remembered at the staff lunchroom for devouring cans of Dinty Moore Beef Stew on an almost daily basis throughout the school year, and another does not cook for herself at all, living on tuna fish sandwiches, fast food takeout and raw vegetables. In other words, they're an easy group to please; just about any home cooked dish wows them. 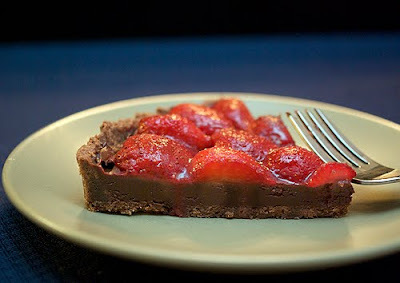 This strawberry chocolate truffle tart is an exercise in excess. 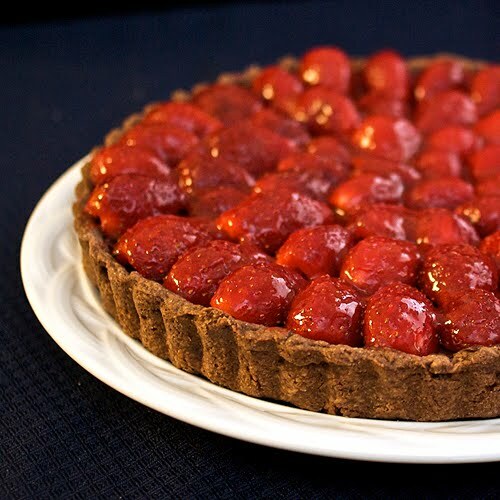 It's really an amalgam of recipes, with a chocolate crust, a rich chocolate filling, and a traditional glazed strawberry tart topping. It takes a little time to pull together, but is not at all difficult. It is impressive looking and quite delicious. The chocolate crust is from Baking with Julia. 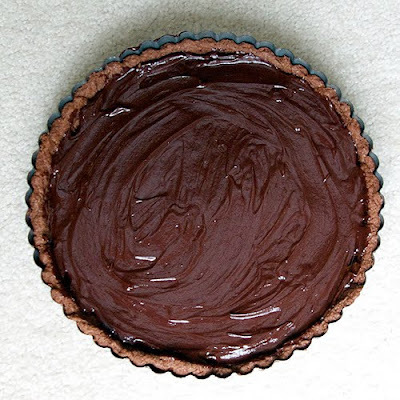 Essentially a pâte sucrée dough with 1/4 cup of cocoa powder replacing an equal amount of flour, it is an easy, forgiving dough to work with and produces a tasty crust. A printable version of the recipe is here. Mix dry ingredients in a medium bowl. Cut in butter. With fingers, work butter into the flour mixture until you have a crumbly mixture. Mound the mixture and make a well in the center. Stir in the egg yolk and ice water with your fingertips, like making pasta. Add just enough cold water for the dough to come together; it should still seem dry and only just hold together. Wrap the dough in plastic, flattening to a disk, and chill until firm. Preheat the oven to 350º F. Lightly butter a 9-inch tart pan with a removable bottom. Roll out the chilled dough and place into the tart pan. Prick the bottom of the tart all over with a fork. Place the tart on a baking sheet and bake for 14 to 18 minutes, rotating half way through. When done, remove and let the crust cool completely before filling. In double boiler above simmering water or in microwave, melt chocolate. Add cream and stir until thoroughly mixed. Filled cooled tart shell and chill in refrigerator for at least one hour before topping with strawberries. Puree 1 pint of strawberries in blender with sugar lemon juice and cornstarch. Pour mixture into a small saucepan and heat over low until thickened and transparent. 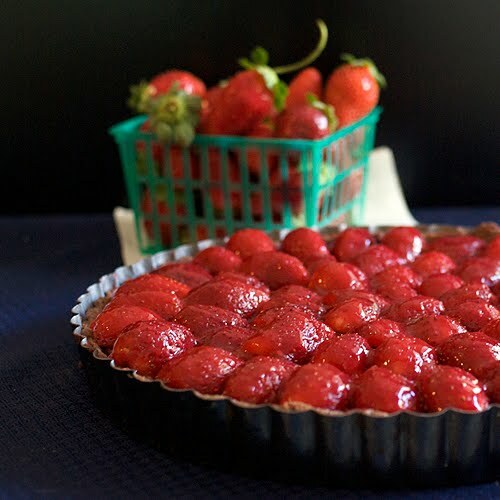 (For a clearer glaze, puree strawberries and filter through a fine sieve before adding other ingredients.) Cool. 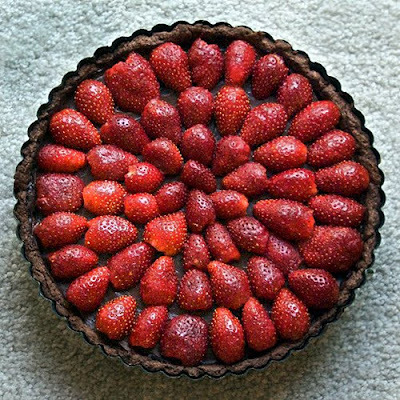 Slice remaining pint of strawberries in half and arrange on top of the chilled tart. Brush glaze lightly over the top of the strawberries. 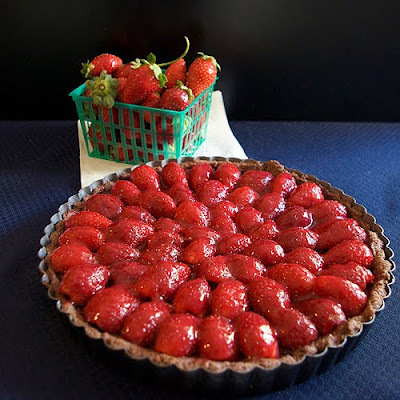 The tart is probably best served the day it is made. I came across Kecap Manis Cap Nonya while staying at a small hotel just outside of my wife's hometown of Kediri. We were there because her brothers and their families had come from Jakarta and Bandung to celebrate my father-in-law's 80th birthday. Needing a place to sleep, we all headed up the hill towards Pohsarang, a place of pilgrimage for Catholics in Java. On weekends buses from across Java fill the narrow roads and the hotel fills up, but it is quiet during the middle of the week. In fact, there were no other guests the two nights we stayed there. 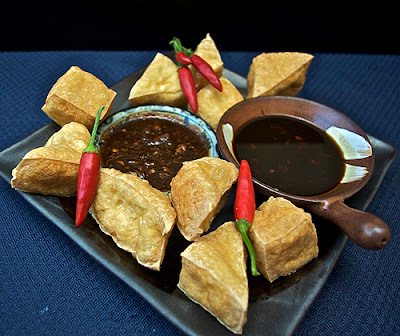 In the morning the hotel cooked up some delicious tahu goreng with sambal petis. This is a simple dish that relies on good ingredients. Cap Nonya provided a nice smoky sweetness to balance the funk of the petis (a fermented shrimp paste used in a number of East Javanese dishes). Quarter the blocks of tofu into cubes or triangles. Fry in hot oil until crisp and golden. Mix all of the sambal ingredients in a mortar. Serve with the warm tofu. Vegetarians can omit the petis and substitute the juice of half a lime. 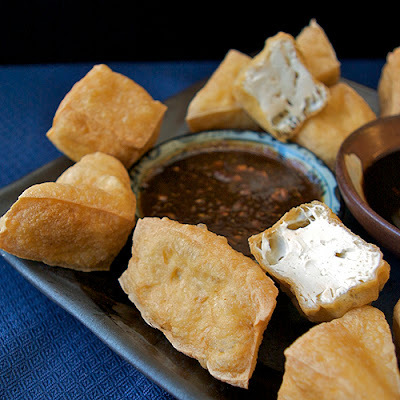 You might also experiment by substituting a teaspoon or so of fermented tofu. 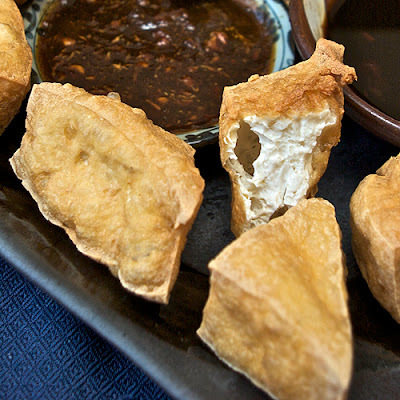 Kecap manis is to the Javanese kitchen what nuoc mam is to the Vietnamese; there is no good substitute, and without it many Indonesian dishes just can’t be properly prepared. Fortunately, in Asian supermarkets in the US (at least in Sacramento) kecap manis is easily found. 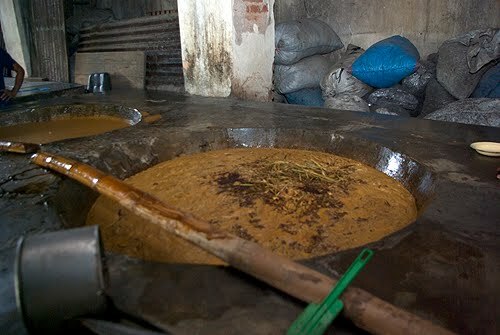 ABC is the most widely available brand of kecap manis. Produced by Indofoods (an Indonesian conglomerate that is the equivalent of Kraft in its size and scope, offering an extensive array of food stuffs), ABC is as widely available in Indonesia as Budweiser is in the US. Cap Bango (Stork Brand) is another brand that is distributed across the archipelago and in the US and is the one we generally use in our home. 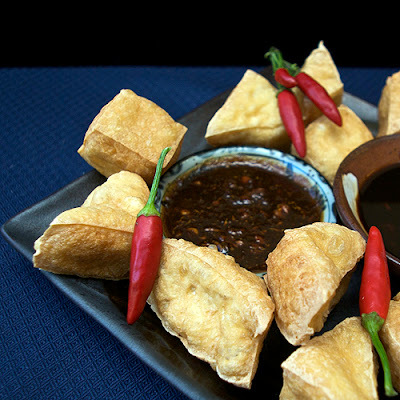 Come to Indonesia and you will discover many more makers of kecap manis. But come soon. 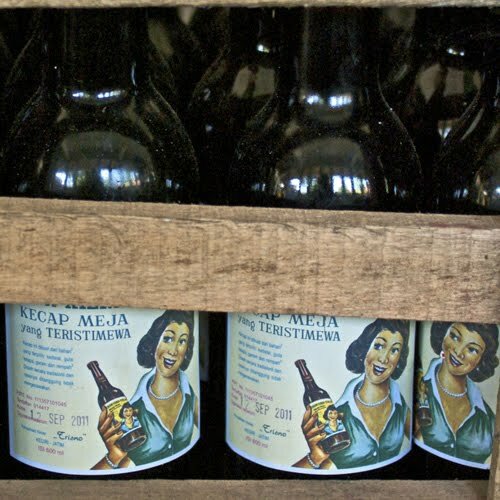 Although there are still many small operations producing kecap manis for their regional markets, just as big breweries brought about the disappearance of regional beers in the US, so have the larger kecap manis manufacturers eliminated many of the smaller producers in Indonesia. As Walmart has discovered, volume of scale trumps quality in terms of economic viability in the long run. It simply isn’t possible for the smaller producers to offer bottles of kecap manis at the same prices as ABC andso they vanish from the market. 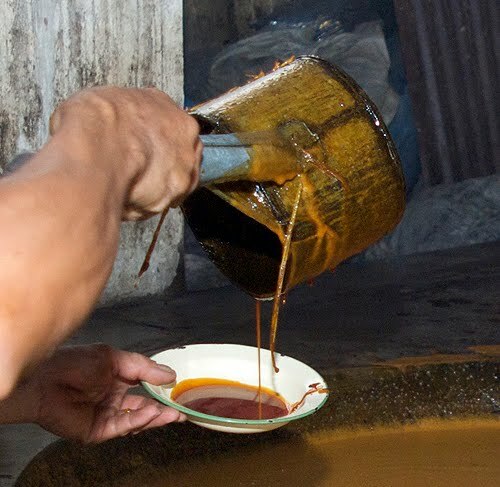 Known locally as Cap Nonya (Lady Brand), Kecap Manis Lauw Kiem Tik Kediri is a locally produced brand of kecap manis that is not widely distributed beyond Kediri. Produced in the back of a nondescript house on a side street where women sell flower petals to adorn graves, Cap Nonya is owned and managed by Bu Evie Pratikno, a lively, charming woman in her 70s who also produces mulberry wine for the local church. The company was started by her grandmother, continued by her father, and passed on to her. Bu Evie returned to Kediri to take over the business after studying to become an English teacher at Satya Wancana in Salatiga, a well known teacher’s college in Central Java. When she dies, she does not know what will happen to the business as she has no children to leave it to. Made in relatively small batches, Cap Nonya has a slightly herbal, almost floral quality that is missing from the mass produced kecap manis. It is the difference between a handcrafted IPA and a can of Coors. This does not come without great effort; Bu Evie works hard to turn out a superior sauce. She starts by making her own kecap asin (regular, salty, soy sauce). This is a process that takes several months. Chubby Hubby has a good description of that process here. Only when the kecap asin is ready, can the kecap manis be made. 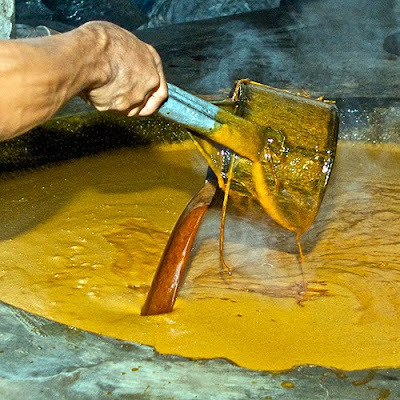 Producing kecap manis is not, says Bu Evie, “untuk orang malas”, for lazy people. Use a low grade of sugar and the quality suffers. Skip a step or try to rush the process, you produce something that you don’t want to put your name on. 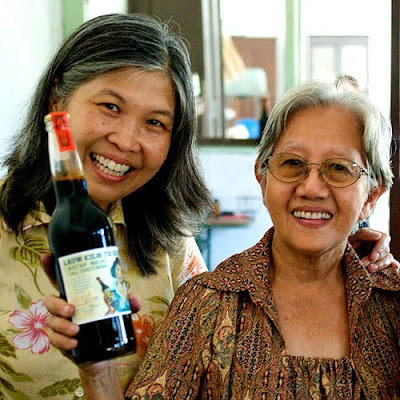 What is especially impressive is that Bu Evie produces her kecap manis, from making the kecap asin to bottling the finished kecap manis and adhering her classic labels, with only two other workers. She tests each batch as it is being made to make sure it meets her standards. 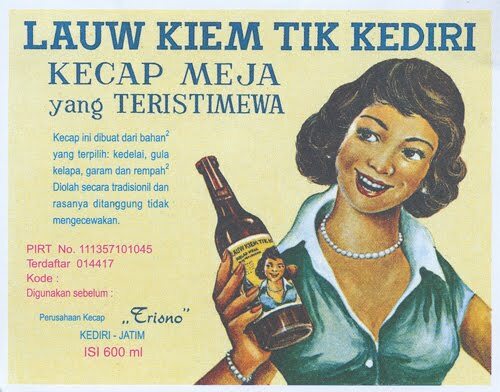 It is clear in talking with her that Bu Evie does not continue to make kecap manis simply for the money. Even with her low overhead, her profit margin is slim. A standard, 600 ml bottle sells for a little over $1. Her pride in her kecap and recognition of what her grandmother created is what motivates Bu Evie. She continues to make Cap Nonya Kediri because it is her legacy from those who came before her and her care for it is a way for her to honor and pay respect to her grandmother and father. Kecap Manis Cap Nonya Kediri is available at better stores in Kediri. If you are ever in Kediri, try to pick up a bottle or two to use on your nasi goreng, mi goreng, sate, tahu goreng, gado gado, or other favorite dish. My wife and I actually brought back five bottles to the US; Bu Evie arranged to have them packaged in plastic bottles for us (although I insisted on bringing one glass bottle). If you can't find it in stores, and you are in Kediri, you might try contacting Bu Evie directly. Driving back to Surabaya after a brief visit in Yogyakarta, we passed these warungs selling baked young coconuts. 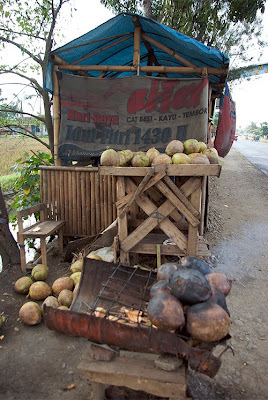 I had seen these on other visits to Java, but was never in a car that I could simply ask the driver to stop. These never seem to be sold in cities, only in the countryside. I asked the driver to stop and we got out and bought a few to taste. I asked the woman, Bu Sari, what the purpose was of roasting the coconuts. She didn't answer directly, but claimed all sorts of health benefits from drinking the juice. It was good for the kidneys, for the blood, would lower cholesterol, and treat gout, among others. I just wanted to know how it tasted. 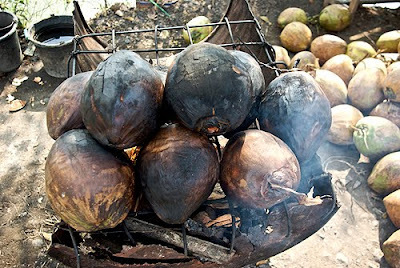 I don't know what effect the roasting of the coconuts has. It appeared it may have somehow increased the liquid content of the coconuts. 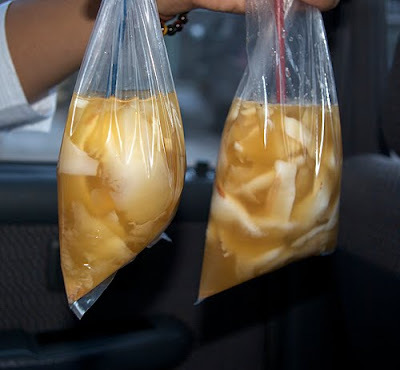 Each seemed extremely juicy; there was about a liter of juice from each coconut. 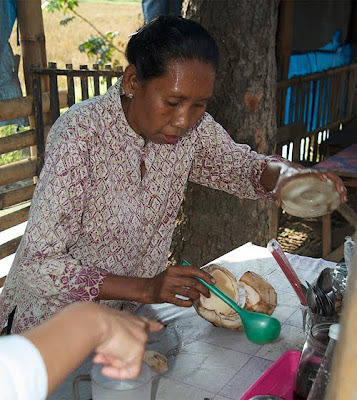 Bu Sari mixed the juice of the coconut with powdered ginger, gula jawa, and honey, producing a sweet, warming drink. It was not as refreshing as simple es kelapa muda, but was better than a carbonated soft drink. Our take-aways certainly made the drive more bearable.